Tapping into your positive energy and reshaping a block of wood into something worthy of praise is perhaps the greatest feeling ever. Taking your passion for woodworking to the next level, we will discuss some of the ways this hobby can help you earn a sweet side income. Let’s admit it: Items such as bookcases, dresses, birdhouses, wine holders, tables, and desks are highly-sought after. So why not channel your love for woodworking and put your woodworking skills to some good use? With more people looking to add “character” to their living space or workplace or simply looking to have a positive impact on Earth by relying on all-natural-everything, woodworking projects can promise a healthy profit. Having said that, when looking to sell your woodworking projects, it is important that you ensure that your products match the highest standards and offer value for money. With a minimalistic, vintage vibe, the mid-century style basically refers to any piece of furniture, décor, or design which may have been created, and was popular in, the mid-20th century. Since its introduction and then subsequent evolution, the mid-century designs today have become somewhat timeless, offering a very classy but retro feel that still appeals largely to even the most style savvy crowds of today. Mid-century furniture, particularly a mid-century credenza, works very well with the design and décor preferences of today, blending in seamlessly with a variety of architectural styles. In fact, almost all millennials seem to own a generic, IKEA version of this. However, they don’t have quite the same appeal. Since the mid-century and mid-century modern pieces of furniture are mostly made in wood, they offer the warmth and versatility that conventional contemporary pieces with the same clean lines, geometric angles, and organic curves don’t. A mid-century credenza, with its polished wood finish and beveled edges, is often considered the perfect eclectic fit in living rooms and sitting areas that require the oomph of a statement furniture piece to uplift the space and make it stand out. That said, buying a mid-century credenza made from solid wood can often cost an arm and a leg, causing most people to settle for the IKEA alternative. Luckily the ease of making this particular piece of furniture as well as the market niche for it given its general decorative popularity, offers a fantastic opportunity for the woodworking enthusiast in you to not only practice and polish your skills by attempting to make one on your own, but also gives you the chance to capitalize on the market need to make a good profit by selling your creation. 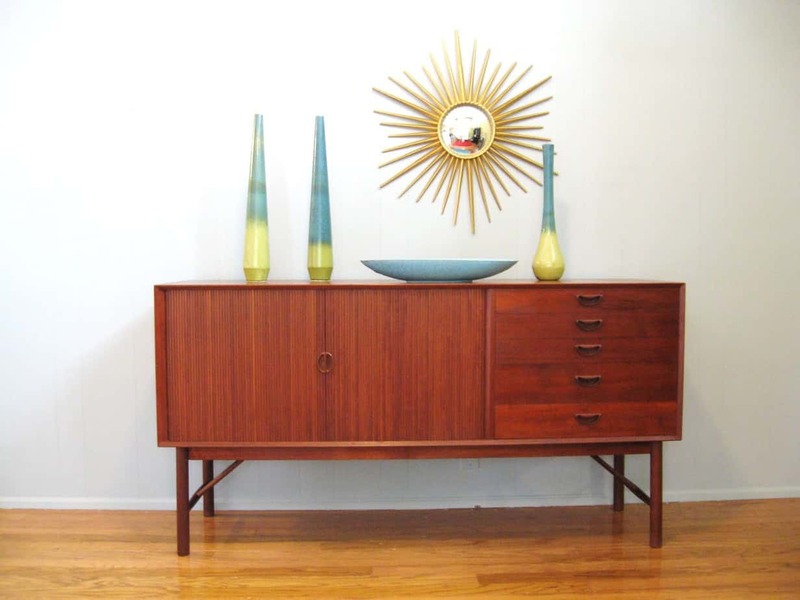 If you’re one to follow written directions well, you’ll appreciate the details offered by the FineWoodWorking how-to guide to the perfect mid-century credenza. It’s rare when one hasn’t come across a packing pallet. They’re often used in shipping goods securely from one place to another. With their flat transport structure and sturdy build, pallets are perfect for bearing large loads without compromising on the safety of the goods. However, once a package is delivered, a pallet, irrespective of how robust it is, becomes virtually useless and it is often thrown away. A packing or shipping pallet is a wonderful opportunity for a woodworking enthusiast to use easily accessible, good quality solid wood that was otherwise going to go to complete waste, and turn it around to fashion into a beautifully rustic décor item – a Pallet Wine Rack, in this instance. Pallet wine racks are nifty household items made from repurposed wood that are great for storage. They can hold multiple bottles of a wine collection and store glasses underneath. They also add great appeal to the interior or even the exterior of a home – they look great mounted on a wall on the back deck. While they’re very quick and easy to make for a woodworker or a devoted DIY-er, they also hold a lot of public appeal – people are always quite willing to pay a good price for a well-made Pallet Wine Rack. If anyone has a home deck, patio, or any outdoor living space they’ve ever wanted to buy furniture for, they know just how expensive good quality outdoor seating can be. You have to buy something that suits and blends well with the surrounding environment, matches the outdoorsy aesthetic, is comfortable, but is also durable. The Adirondack chair and loveseat is all of that and more. What’s better is that it’s fashioned for quick assembly and building, making it possible for the most novice of carpenters to make them. Adirondack chairs and loveseats have curved recesses and wider arms that allows one to sit comfortably for longer periods of time without straining their body. The back curvature without the steep downward slope makes it possible for even the frailest person to lift themselves out of the chair without requiring extra support. If you have a mind to make and market an Adirondack chair and loveseat, just keep in mind that it’s essential that you use pressure-treated, high quality wood that’s impervious to insect infestation and rotting. Knotted pine or cedar works quite well to that end. Check out this tutorial to give one a go on your own. There’s just something about incorporating both vintage and antique pieces of furniture in the midst of modern day contemporary architecture. Old-age pieces such as a Queen Anne Dressing Table, with its cabriole legs, cast brass hardware, wonderfully carved shell, and drawer dovetailing, speak very boldly of 18th-century woodworking expertise. They also offer fantastic opportunities for wood enthusiasts to polish their cabinetmaking skills and find a specialist niche for themselves. Amongst the very many statement pieces used today, Queen Anne dressing tables are equally as popular today as they were in the olden days because they’re just as attractive as they were back then, and equally multifunctional. Their delicate features, which belie the actual sturdiness of the piece itself, are decidedly feminine and look well in place in a formal drawing room. Here’s how you can try your hand at making one. Industrial designs and rustic furniture pieces aren’t just limited for use in a country house, farm, or backyard pub. Eclectic pieces such as the Pipe Leg Table look fantastic in minimalistic living or working spaces that have a simplistic architectural vibe. Buying industrial furniture from specialist stores often means being okay with a very hefty price tag for most. However, you can just as well make a Pipe Leg Table, on your own and in your own time – and it doesn’t even require the use of any complicated, specialized power tools and equipment. All you really need is pre-threated fittings and pipes, and a sturdy piece of wood, and you can put together a great piece of furniture in no time. Here’s how. Most up and coming woodworkers, especially those who are still in the process of learning the basics of their craft, tend to dismiss the potential of single sheet plywood. While there’s no doubt that there is nothing quite like working with a solid chunk of high-quality wood, you have to know that if you’re imaginative and talented, you can fashion the most interesting – and comfortable – pieces of furniture from something as basic as plywood. The Rok-Bak Chair is the perfect example of such a piece of furniture. It’s a culmination of an economic, ergonomic and aesthetically pleasing design that works like no other. In a Rok-Bak chair you’ll find wide armrests, a sloping back, a comfortable headrest, and a foot stool that makes getting comfortable very easy. That said, putting it together is slightly tricky to say the least and requires a tad bit experimentation to get it just right. Think of it as a jigsaw puzzle that needs to be put together and you’ll do just fine. Here’s how you can make yourself a Rok-Bak Chair. Go a step further and finish it with customized upholstery and you’ll find yourself with quite the impressive finished product. Plywood coffee tables are more popular than you would believe. They’re simple, lightweight, multipurpose, and are very pleasing, aesthetically. A plywood coffee table is often used as an accent table in living rooms, or in private studies, and can even work well in formal lounging areas. They are also quite popular as weekend DIY projects for most homeowners and woodworking enthusiasts because they’re quick to put together, require the use of next to no fasteners, and can be made from as little as half a sheet of plywood – without any wastage. If you’re looking to earn a quick buck without a lot of monetary investment or effort, try making and selling Plywood coffee tables. If, as a woodworker, you are looking to diversify your portfolio, and up your woodworking game, venturing into making a Collector’s Case is definitely the right thing to do. A light hand, the right touch, and that attention to detail to cut, scrape, dovetail, and sand the joints and pieces is what is needed for them to perfectly come together in constructing a high quality case. If you’re going to make one and then market it for a profit, be sure to put all that you know in the detailing, because that’s what’s crucial. Apart from offering safe and secure storage in one place for one’s collectives, a collector’s case also works really well as a decorative accessory in a home. Depending on your choice, you can also fashion the collector’s case into a display case by swapping a wooden boxed top with a glass door. Add a plush velvet inlay and a locking hardware and you’ve got yourself a protective space to organize AND safeguard your valuables. Sideboards have been staple in formal drawing rooms for as long as we can remember. Often used for storing silverware and dining linens with the cupboards holding either the serving trays or select pieces of cutlery. The top deck of the sideboard either served as a staging area to display food items, or work as a makeshift bar, holding the decanters of fine spirits. The elaborate, delicately carved and detailed sideboards aren’t that common anymore in regular households – largely because it’s rare to find large dining areas and formal sitting rooms in a basic two story home. However, simplified and compacted versions of the sideboard are still quite popular today. They’re multifunctional and useful and tend to add that right amount of accenting needed in a lounge, along with providing a much needed storage option in a limited living space. They are also simple enough to build and assemble, especially if they have been divided into a few different sub-assembles which can be put together to sideboard in its entirety. These sideboards often sell really well given their multipurpose appeal. If you can master making one right, you’ll find yourself with a great side business—one that’s enjoyable, and profitable at the same time. In a world that’s shrinking in size as much as it’s increasing in information, the average Joe just cannot afford to spend on and live in sprawling homes with multiple rooms and endless storage space – can you imagine the upkeep on such a place? As such, there’s an ongoing quest to make furniture pieces more efficient and compact in order to help homeowners capitalize on the living space they do have, maximizing its storage potential. Large highboys that take up more space than they provide, bulky chests, and cabinets are rarely found in modern, contemporary homes. However, what you will find in most new living spaces are storage drawers that can slide beneath major furniture pieces already present in the room. This can be a bed, wherein the drawers can be concealed out of view immediately and still provide storage that is needed. Under bed storage drawers kill two birds with one stone. They’re compact to aid in storage convenience, and they’re concealed from view to prevent cluttering up a limited space. Add in the fact that they are very easy to make for someone who knows their way around woodcutting power tools, and you’ve got a great weekend DIY projects for a little extra income. With under bed DIY storage drawers, you can keep it simple by creating a crate-like structure and adding wheels for easy mobility. You can also customize them for security of valuables and to keep them dust-free by adding a sliding cover on top. Farmhouse style trays are that perfect household accessory that can seamlessly combine aesthetics with functionality. Apart from helping transport bulky things from one place to another, the farmhouse style trays are often used as decorative items to hold centerpieces on coffee or dining tables. They also make lovely gifts for both your closest friends as well as workplace acquaintances. You can load the tray up with a bunch of exciting ornamental items and goodies, wrap them up nicely, and present them to a loved one, or you can simply wrap up a pair of them and give them on their own at a housewarming party. You can also make these farmhouse style trays yourself from scratch. In fact, add a few decorative touches to the tray, such as filigree designed metal corner brackets, polish it up nicely, and you can sell them in pairs or sets for a tidy little profit. Follow the instructions here to make your very own farmhouse style tray or watch the video below for a detailed tutorial. For some reason, children and adults alike love and appreciate hand-crafted, useful household items such as a DIY wood clock. Wood clocks can be used for decorative purposes to add that warm touch on your dining room’s mantle, or they can be mounted on a wall in any room of the house and just keep time for you. While children are usually more interested in decorating the clocks as weekend DIY projects, woodworking enthusiast adults find it quite appealing to make their own wood clocks. On the flipside, the hand-made arts and crafts aficionados love buying things like the wood clock, either for themselves or their closest friends and family members. Either way, it’s a good activity, trying to make your own wood clock at home. There are so many different types of wood clocks that you can make. From simple, basic ones using only a sheet of plywood, to structuring one from individual pieces of a wooden pallet. Wood as a constructive material is so versatile. From making entire homes, you can make such interesting, nifty little household items that not only look great decorating any space, but are also equally useful. Wood is especially great for making organizers and storage items that help clean up the chaotic messes of a home, containing one’s valuables effectively but also aesthetically. One such item is the DIY wooden utensil organizer. Fashioned from a wooden packing pallet or any old wooden box you might have on hand at home, the utensil organizer is very quick and very easy to make. You can either make a utensil organizer by adding cast iron hanging hooks or mount it on your kitchen wall to hold your spoons, or even small pots and pans. You can even make a boxed organizer which holds your kitchen utensils like a pencil holder would store pencils.